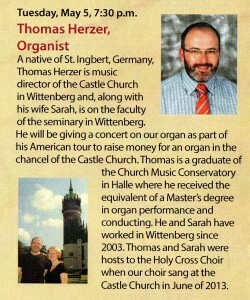 Thomas Herzer, Music Director of the Castle Church in Wittenberg, Germany will present an organ recital on the Rodgers hybrid organ at Holy Cross Lutheran Church in Libertyville. This program is part of his American Tour to raise funds to install an organ in the chancel of Castle Church. Thomas is a graduate of the Church Music Conservatory in Halle where he received the equivalent of a Masters Degree in organ performance and conducting. Castle Church hosted the Choir of Holy Cross Lutheran Church when they performed a concert there in June of 2013.